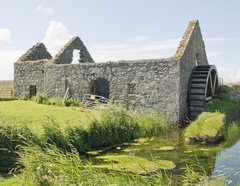 The Mill at Cornaig was commissioned in 1771 by the 5th Duke of Argyll. It was to grind the corn for the whole island, thus replacing inefficient horizontal mills, and hand mills or querns. Work began in 1802. 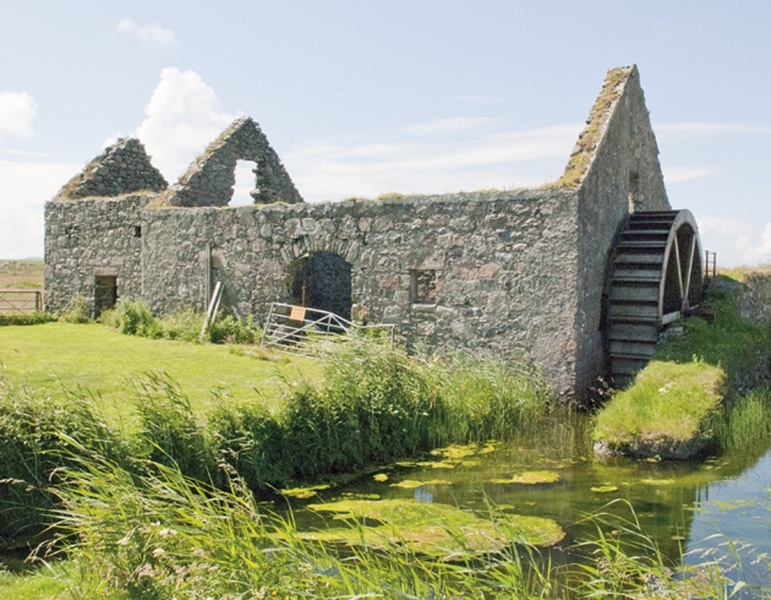 A lade from Loch Bhasapol to the mill was constructed with a sluice gate at the loch end. This raised the level of the water in the loch and provided a year round flow to the wheel which is of the ‘breast’ type, as the water hits the wheel at mid height. The mill was completed in 1803, and from 1804 until 1945 a succession of millers lived and worked at Millhouse. However after 1945 the mill underwent a period of dismantling and decay. The wheel was rescued and restored in 2006 by the Boyd family who are the present owners. Ian MacArthur, a local skilled metal worker, agreed to undertake this challenging project. The work was done in situ as the wheel was too fragile to move, but the original cast iron shrouds and central naves and shaft were still intact and are the ones you see today, over 200 years old. New bearings were engineered, and new larch paddles and sole boards were painstakingly replaced one by one. Even the bolts were made with square heads, to replicate the original (present day bolts have hexagonal heads). The sluice gate at the loch was repaired, and at the mill end a new trap door which acts as an ‘on/off switch’ was made to direct water either onto the wheel or down the shute. Amazingly, this is operated by the original handle which was discovered in the debris. The wheel can be seen in action for a time most afternoons during the summer. Please enjoy the spectacle, but remember this is private property, and climbing up to wheel, or entering the mill, is strictly forbidden.